Registered nurses who complete online RN to BSN programs increase the opportunities to advance their careers and increase their earning potential. They also receive preparation for a master or doctoral degree in nursing, if they choose to go still further in their studies. The American Association of Colleges of Nursing (AACN) reports that employers value BSN nurses for their skills in leadership, critical-thinking, health promotion and case management as well as their ability to practice nursing in an array of inpatient and outpatient environments. Numerous organizations recognize the unique value BSN nurses bring to healthcare environments, including federal agencies, nurse executives, nursing organizations, military, magnet hospitals, healthcare foundations and minority nurse advocacy groups. According to the AACN, the BSN is an essential degree for nurses who seek to provide a higher level of quality care or to move up the career ladder. Several leading nursing organizations, including the AACN, the American Organization of Nurse Executives (AONE), and the American Nurses Association (ANA), recognize the BSN degree as the minimum educational requirement for professional nursing practice. In its report, "The Future of Nursing: Focus on Education," the Institute of Medicine of the National Academies recommends "academic nurse leaders across all schools of nursing should work together to increase the proportion of nurses with a baccalaureate degree from 50 to 80 percent by 2020." According to the AACN, there are four times as many RNs as physicians in the U.S., and nurses deliver a wide range of health care services, including preventive and primary care by independent nurse practitioners in family health, women's health, pediatrics, and more. Not only are nurses the primary providers of patient care in hospitals, but they also deliver most of the country's long-term care. A nurse with a BSN degree may have added responsibilities including providing support to patients and their families, educating patients about their health habits, helping develop a patient care plan, and helping doctors during major procedures and operations. See also: What can I do with a Nursing degree? We selected the programs based on the quality of the program, types of courses provided, faculty strength, nursing school awards, and rankings and reputation, including the reputation for providing online degree programs. University of Illinois at Chicago, College of Nursing ranks #1 on The 50 Best Online RN to BSN Programs! The University of Illinois at Chicago (UIC), a research intensive institution founded in 1913, enrolls about 29,000 students. The UIC College of Nursing, established in 1951, offers degrees ranging from baccalaureate to Doctor of Philosophy and Doctor of Nursing Practice programs, as well as certificates. Approximately one-third of the College of Nursing faculty are American Academy of Nursing (AAN) Fellows, with six designated as AAN Living Legends. The university holds designation as a PAHO/WHO Collaborating Centre for International Nursing Development in Primary Health Care. The College of Nursing was the first college of nursing designated as a World Health Organization Collaborating Centre for Nursing and Midwifery Development in the United States. The UIC College of Nursing has received national recognition for its productivity in research and translation of research findings into healthcare practice and consistently ranks in the top 10 among nursing schools for funding from the National Institutes of Health. Students can complete the program in 16 months to four years. Students can complete coursework any time of day but must meet deadlines. The UIC College of Nursing offers courses in eight-week terms except for one four-week summer course. Students have access to online orientation, academic and financial advising, and on-call technical support. The University of Illinois at Chicago is regionally accredited by The Higher Learning Commission (HLC). The school is also accredited by The Commission on Collegiate Nursing Education and the Accreditation Commission for Midwifery Education. Indiana University, School of Nursing ranks #2 on The 50 Best Online RN to BSN Programs! Indiana University (IU), a public university system founded in 1820, enrolls about 110,000 students. Founded in 1914, IU's School of Nursing, among the largest in the nation, provides a range of degree options, including a Bachelor of Science in nursing, a Master of Science in nursing, a Doctor of nursing practice, and a Doctor of Philosophy in nursing studies. While IU School of Nursing's main campus is located in Indianapolis, the School of Nursing has a strong presence on all eight IU campuses. Every year, about 40 percent of the baccalaureate prepared professional nurses in Indiana graduate form the Indiana School of Nursing. The School of Nursing received recognition from the National League for Nursing as a Center of Excellence in Nursing Education for Promoting the Pedagogical Expertise of Faculty and the school received recognition for Advancing the Science of Nursing Education. The School of Nursing's Citizen Diplomacy Program received recognition as a Top Program from the Global Health Task Force and the U.S. Center for Citizen Diplomacy. The School of Nursing has award-winning faculty members. The School of Nursing has many partnerships including governmental, industry, and clinical as well as international partners to advance health, wellness, and nursing education throughout the nation. IU's School of Nursing's online RN to BSN degree completion option prepares graduates for careers in long-term care, home care, community settings, and more. The curriculum provides students with a broad knowledge in social sciences, humanities, biological sciences, and nursing. The program also helps students develop strong critical-thinking and decision-making skills. Applicants must hold an associate's degree in nursing and a current RN license. Students must complete a capstone course. Courses incorporate clinical experiences or practicum. Full-time students can complete the program in 12 months, while part-time students can enroll in 18-month or 24-month options. IU offers its courses in seven-week or eight-week modules. Students can finish four courses each semester. The program does not require campus visits. Indiana University is regionally accredited by The Higher Learning Commission (HLC). The school is also accredited by the Commission on Collegiate Nursing Education and the American Nurses Credentialing Center's Commission on Accreditation. Rutgers Online, Rutgers University, School of Nursing ranks #3 on The 50 Best Online RN to BSN Programs! Rutgers University, a public, land-grant and sea-grant, research university established in 1766, is among the oldest in the nation. Also, one of the largest universities in the state, Rutgers enrolls 67,500 students from around the world and offers more than 300 undergraduate and graduate programs leading to a host of associate, bachelor, master, doctoral and professional degrees and certificates. Rutgers University established the School of Nursing in 2014, however the university established the preceding College of Nursing in 1956. The School of Nursing offers undergraduate and graduate degrees and post-master's certificates, and is one of the eight schools of Rutgers Biomedical and Health Sciences. The comprehensive School of Nursing enrolls about 1,700 students. Through Rutgers Online and the Rutgers School of Nursing, students can earn an online RN to BS in Nursing degree. The fully online curriculum provides students with the foundations of nursing leadership and helps them hone their critical-thinking skills. The program prepares graduates for careers in emerging nursing specialties, clinical leadership roles or advanced degrees. Applicants must hold an associate's degree and an active RN license. Rutgers University allows students to transfer up to 90 credits. Rutgers University offers three start dates each year. Students can take classes year round on a full-time or part-time basis. Online students have access to career services. A member of the Association of American Universities, Rutgers University is regionally accredited by the Middle States Commission of Higher Education (MSCHE). The Rutgers School of Nursing is also accredited by the Commission on Collegiate Nursing Education. University of Iowa, College of Nursing ranks #4 on The 50 Best Online RN to BSN Programs! The University of Iowa, a public, flagship, space-grant university established in 1847, is among the oldest universities in the state. The university enrolls about 33,000 students in hundreds of programs of study through 11 colleges. Founded in 1898, UI's College of Nursing offers bachelor, master and doctoral degrees in nursing. The College of Nursing provides a nationally recognized program in advanced training and nursing leadership and has received recognition as one of the best research institutions in the United States. The College of Nursing has received recognition in three research areas: Health System Improvement, Pain, Palliative Care, and Symptom Management, and Gerontology. The University of Iowa College Of Nursing is designated as an NIH Center for Excellence in Pain Education. The College of Nursing, part of the Academic Health Center, collaborates with the University of Iowa Hospitals and Clinics to provide clinical experiences. Applicants must complete general education requirements and prerequisites before applying. Part-time students can complete the program in five semesters, while full-time students can earn their degree in three semesters. The online program includes face-to-face components in a student's county of residence. Students can complete the leadership course at their place of employment, while the college requires students complete the community and public health practicum in Iowa with a valid Iowa nursing license. A member of the Association of American Universities, the University of Iowa is regionally accredited by the Higher Learning Commission (HLC) and the Commission on Collegiate Nursing Education. Arizona State University–ASU Online ranks #5 on The 50 Best Online RN to BSN Programs! Arizona State University, a public research university founded in 1885, is among the largest public universities in the nation with over 80,000 students enrolled, including more than 24,000 enrolled through ASU Online. Established as the School of Nursing in 1957, the College of Nursing & Health Innovation enrolls about 3,300 students through undergraduate, graduate, Doctor of Nursing Practice and Doctor of Philosophy in Nursing programs. The College of Nursing & Health Innovation has 229 faculty members, including 34 Fellows in organizations including the American Academy of Nursing, American Association of Nurse Practitioners, National Academies of Practice, and Robert Wood Johnson Executive Nurse. The U.S. Department of Veterans Affairs selected the College of Nursing & Health Innovation for the VA Nursing Academic Partnership Program. The College of Nursing & Health Innovation has nationally recognized research leaders and the college received the American Association of Colleges of Nursing (AACN) Exemplary Academic-Practice Partnership Award for its partnership with the Mayo Clinic. Students must complete a capstone course, the Synthesis of Professional Nursing. Online students can complete the program in 15 to 18 months. Students must complete 10 core courses with 38 credits. Students can transfer some credits from other online RN to BSN programs. Arizona State University is regionally accredited by The Higher Learning Commission (HLC) and the College of Nursing and Health Innovation is also accredited by the Commission on Collegiate Nursing Education. Ohio State University, College of Nursing, Ohio State Online ranks #6 on The 50 Best Online RN to BSN Programs! The Ohio State University (OSU), a public, land-grant, space-grant and sea-grant university founded in 1870, is among the largest university campuses in the nation. The university enrolls more than 59,000 students on its Columbus campus and boasts an alumni network of 475,000. Founded in 1914, the OSU College of Nursing offers a host of nursing degree programs ranging from bachelor's to doctorates. A member of the Association of American Universities, Ohio State University received recognition by the National League for Nursing as a Center of Excellence in Nursing Education for Enhancing Student Learning and Professional Development. Offered through the College of Nursing, Ohio State University's online Registered Nurse (RN) to Bachelor of Science in Nursing (BSN) program prepares graduates for careers in a host of healthcare settings as well as graduate study in nursing. The curriculum integrates wellness and evidence-based practice while helping students develop effective leadership skills. The program also allows students to apply skills and knowledge of patient care technologies and information management as well as address ethical, legal, emerging, and historical issues. The college offers the program on a full-time or part-time basis. Applicants must hold an associate's degree from an accredited institution, complete prerequisites and hold a current RN license. Seamless academic pathways are available with collaborative community college partners to allow students to pursue the BSN while completing an associate degree program. Students must complete 30 of the required 120 semester credits at Ohio State University. Ohio State University is regionally accredited by The Higher Learning Commission (HLC) and by The Commission on Collegiate Nursing Education. University of Colorado Denver, College of Nursing ranks #7 on The 50 Best Online RN to BSN Programs! The University of Colorado Denver, a public research university founded in 1912, enrolls about 18,000 students. Part of the University of Colorado system, the university offers a range of undergraduate, graduate, and professional degrees. Founded in 1898, the College of Nursing enrolls more than 950 students in undergraduate and graduate programs. The College of Nursing's main campus is located on the Anschutz Medical Campus. Faculty members have worked in developing countries. The College of Nursing constituted the first nurse practitioner and school nurse programs in the nation and has one of the oldest research doctoral programs in the West. The College of Nursing has affiliations with the Children's Hospital Colorado, the University of Colorado Hospital, and the Veterans Affair Medical Center. Designed for adult learners who also hold registered nurse licenses, the University of Colorado Denver's online Registered Nurse to Bachelor of Science in Nursing program integrates clinical practice evidence. The program provides students with competency development in nursing research, professional nursing or health assessment for RN's as well as clinical experiences in case management, leadership and management, and public health nursing. The program also provides students access to clinical information systems and patient care technologies. Students can complete the fully online program in four terms. Students complete one practical experience of 30 hours. The University of Colorado Denver is regionally accredited by The Higher Learning Commission (HLC). The university is also accreditated by the Commission on Collegiate Nursing Education and the Accreditation Commission for Midwifery Education. Loyola University Chicago, Marcella Niehoff School of Nursing ranks #8 on The 50 Best Online RN to BSN Programs! Loyola University Chicago, a private, non-profit, Catholic, research university founded in 1870, consists of 11 colleges and schools with more than 220 undergraduate, graduate and professional degree programs. The university enrolls about 16,000 students. Founded in 1935, the Marcella Niehoff School of Nursing offers a number of nursing programs from bachelor's to doctorates. The nursing school provides international opportunities in Belize, Rome, England, and Lourdes, France. The U.S. Department of Veterans Affairs selected Loyola University Chicago for the VA Nursing Academic Partnership Program. The school of nursing's research program focuses on four substantive areas: Social Context, Stress, and Epigenetic Determinants of Health; Prevention and Self-Management of Chronic Disease; Health Disparities and Vulnerable Populations; and Optimizing Outcomes in Education and Practice. The Marcella Niehoff School of Nursing's online RN to BSN degree completion program, designed for licensed, professional nurses, features interactive learning and enhances healthcare skills and knowledge. Applicants must hold an associate's degree or hospital nursing program diploma. The school awards up to 25 credit hours for prior learning through a professional nursing e-portfolio. The university offers year-round admissions. Students can complete the 30-credit-hour online program in three semesters. The Marcella Niehoff School of Nursing offers courses in six-week to eight-week sessions. Students can enroll on a full-time or part-time basis. The courses follow an asynchronous format, allowing students to complete coursework on their schedule. Loyola University Chicago is regionally accredited by The Higher Learning Commission (HLC). The nursing program is also accreditated by the Commission on Collegiate Nursing Education. University of Miami, School of Nursing & Health Studies ranks #9 on The 50 Best Online RN to BSN Programs! The University of Miami (UM), a private, nonsectarian research university founded in 1925, enrolls nearly 17,000 students through a dozen schools and colleges. UM offers more than 280 undergraduate and graduate programs. Established in 1948, the School of Nursing & Health Studies offers bachelor's to doctoral degree options. The school's International Academy for Clinical Simulation and Research is one of the first simulation centers in the United States designed exclusively for nursing and health sciences education. The university holds designation as a PAHO/WHO Collaborating Centre for Nursing Human Resources Development and Patient Safety. The University of Miami offers an RN to BSN online program through its School of Nursing and Health Studies. Designed for working nurses, the program prepares graduates to provide quality, compassionate care. Applicants must hold an active RN license to practice in Florida and 60 transferable credits. Students must complete clinical hours at one of the university's network of more than 170 clinical partners. The school offers simulation training through its International Academy for Clinical Simulation and Research as well as study abroad options. Students can complete the program in five consecutive semesters. The University of Miami is regionally accredited by the Southern Association of Colleges and Schools Commission on Colleges (SACS) and by the Commission on Collegiate Nursing Education. Penn State World Campus ranks #10 on The 50 Best Online RN to BSN Programs! Penn State World Campus, established in 1998 as the online campus of The Pennsylvania State University, offers more than 120 online undergraduate and graduate degree and certificate programs. The Penn State College of Nursing includes the Center of Geriatric Nursing Excellence at Penn State. The Penn State College of Nursing has 21 Fellows, including 9 in the American Academy of Nursing, 5 in the Gerontological Society of America, 2 in the Foundation for Hospice and Home Care and one in each of these organizations: American College of Critical Care Medicine, American Heart Association, National Academy of Practice, Distinguished Fellow Nursing Academy (National Academies of Practice), and the American College of Healthcare Executives. The RN to BSN online program prepares graduates for supervisory roles or advanced study as clinical nurse specialists, nurse midwives, nurse practitioners or nurse anesthetists. Designed for registered nurses who hold a valid RN license, the curriculum includes data management, ethics, human development, microbiology, and nutrition. The program also helps students develop strong communication and leadership skills. The program features fully online courses and clinical requirements near the student's home. Penn State World Campus also offers an accelerated curriculum, which features seven-and-a-half-week sessions. RN to BSN applicants must have completed an RN program or hold an RN license. Penn State University is regionally accredited by The Middle States Commission of Higher Education (MSCHE), and also by the Commission on Collegiate Nursing Education. University of Cincinnati, College of Nursing ranks #11 on The 50 Best Online RN to BSN Programs! The University of Cincinnati (UC), a public, space-grant, research university founded in 1819, is among the largest in the state with more than 44,000 students enrolled. Part of the University System of Ohio, the university offers more than 600 programs of study ranging from certificates to doctorates. Established in 1889, the College of Nursing offers degrees ranging from bachelor's to doctorates (DNP and PhD). The UC College of Nursing provides students a variety of experiences at more than 300 clinical settings and more than 750 distance learning clinical facilities located throughout the nation. Students must complete a capstone course that includes a nursing practice project. Students have access to academic advising, financial aid, writing resources, and library resources. The UC College of Nursing offers full-time and part-time options, with six start times per year. Students can complete the online RN to BSN degree in as little as nine months, but students can adjust the academic plan of this flexible program to better align with work-life events. Applicants must hold a diploma or associate degree in nursing and an RN license. The University of Cincinnati is regionally accredited by The Higher Learning Commission (HLC) and the College of Nursing is accredited by the Commission on Collegiate Nursing Education. University of Missouri-Kansas City ranks #12 on The 50 Best Online RN to BSN Programs! The University of Missouri-Kansas City, a public, research university founded in 1933, enrolls about 16,000 students. Part of the University of Missouri System, the university offers a variety of degrees through a dozen schools and colleges. The School of Nursing and Health Studies allows students to pursue nursing degrees ranging from bachelor's to Doctor of nursing practice and nursing doctorates. Designed to prepare RNs to become managers, leaders, advocates, and coordinators, the School of Nursing and Health Studies' RN-BSN online program features team-directed practice experiences. The program also helps students develop strong leadership skills. The nursing program builds off of general education credits and nursing credits earned through an associate's degree program or the National Council Licensure Exam. Students must complete 36 hours at UMKC. The nursing program features courses in both synchronous and asynchronous formats. The University of Missouri-Kansas City is regionally accredited by The Higher Learning Commission (HLC), and also by the Commission on Collegiate Nursing Education. University of Nebraska Medical Center, College of Nursing ranks #13 on The 50 Best Online RN to BSN Programs! The University of Nebraska Medical Center, a public center of health sciences research founded in 1880, enrolls about 3,800 students. Part of the University of Nebraska System, the center offers degrees through six colleges, including medicine, nursing, and pharmacy. Founded in 1917, the College of Nursing offers degrees ranging from bachelor to doctorate as well as continuing education. The University of Nebraska Medical Center offers an online RN to BSN program through its College of Nursing. The program builds on a liberal arts foundation and incorporates evidence-based healthcare education. The College of Nursing offers three admission dates each year. Applicants must hold an associate's degree or diploma in nursing and an RN license. The college awards credits for work experience. Students can complete the program in one to three years. Most nursing courses follow an asynchronous format, but some require synchronous login. The University of Nebraska Medical Center partners with more than 100 health care institutions across the state for clinical learning. The University of Nebraska Medical Center is regionally accredited by The Higher Learning Commission (HLC), and its nursing programs are accredited by the Commission on Collegiate Nursing Education. University of South Florida, College of Nursing ranks #14 on The 50 Best Online RN to BSN Programs! The University of South Florida (USF), a public, space-grant, research university founded in 1956, is among the largest public universities in the state with about 48,700 students enrolled. A member of the State University System of Florida, the university offers more than 200 programs leading to a host of undergraduate, graduate, and specialist degrees. Founded in 1973, the USF College of Nursing offers nursing degrees ranging from bachelor's to doctorates. The College of Nursing has more than 700 clinical partners. The college provides international nursing experiences in Scotland, Panama and St. Croix and the college has a collaboration with the American Red Cross. The U.S. Department of Veterans Affairs selected the University of South Florida for the VA Nursing Academic Partnership Program. The University of South Florida's College of Nursing enables students to complete an online RN to Bachelor's Sequence in three to five semesters. Developed for registered nurses, the program allows students to focus on patient/staff education, clinical experience, or leadership/management. The program also prepares graduates for a master's or doctorate in nursing and Doctor of nursing practice programs. Students must complete Service Learning Practicum Projects, preferably at their place of employment. Program applicants must hold an associate's degree in nursing, live in Florida and hold a current Florida RN license. The University of South Florida is regionally accredited by the Southern Association of Colleges and Schools Commission on Colleges (SACS). The nursing programs are accredited by the Commission on Collegiate Nursing Education. University of Kansas Medical Center, School of Nursing ranks #15 on The 50 Best RN to BSN Online Programs! The University of Kansas, a public, flagship, research university founded in 1865, enrolls 28,000 students. The university offers more than 345 degree programs through several schools, such as law, medicine, engineering, and architecture. Founded in 1905 and located on the University of Kansas Medical Center campus, the School of Nursing provides bachelor, master and doctoral degrees, and continuing education programs. The National League for Nursing designated the School of Nursing a Center for Excellence in Nursing Education. The University of Kansas Medical Center's School of Nursing offers an RN to BSN online program, which builds on a liberal arts and sciences foundation. The fully online program also helps students hone their leadership and critical-thinking skills. The University of Kansas is regionally accredited by The Higher Learning Commission (HLC). The School of Nursing's programs are accredited by the Commission on Collegiate Nursing Education. University of Utah, College of Nursing ranks #16 on The 50 Best RN to BSN Online Programs! The University of Utah, a public, flagship, space-grant, coeducational university established in 1850, enrolls more than 31,000 students. The university offers nearly 200 undergraduate and graduate degree programs. The University of Utah College of Nursing offers a range of programs from Bachelor in nursing to Doctor of nursing practice and a Doctorate in nursing. The College of Nursing includes the Gerontology Interdisciplinary Program and the Hartford Center for Geriatric Nursing Excellence. The University of Utah College of Nursing was designated as one of the first VA Nursing Academic Partnerships in the nation. Offered through the College of Nursing, the online RN-BSN program with Geriatric Nurse Leadership Specialty features evidence-based practica and community-engaged learning. Designed for licensed registered nurses with an associate's degree in nursing, the program emphasizes the care of older adults in all settings. The program allows students to hone their leadership skills while focusing on improving geriatric nursing care. Students must complete a 32-hour clinical shadowing experience, which they can do in their place of employment. Students must attend a one-day on-campus orientation and a poster presentation. The University of Utah is regionally accredited by The Northwest Commission on Colleges and Universities (NWCCU). The school is also accredited by the Commission on Collegiate Nursing Education. Mizzou Online, University of Missouri, Sinclair School of Nursing ranks #17 on The 50 Best RN to BSN Online Programs! The University of Missouri, a public, land-grant university founded in 1839, is among the largest universities in the state with nearly 33,000 students enrolled. The flagship of the University of Missouri System, the university offers more than 300 degree programs through 19 colleges. Established in 1904, the Sinclair School of Nursing offers programs at the baccalaureate, master, doctoral and post-doctoral levels. The Sinclair School of Nursing is an integral part of the University of Missouri Health System. The system also includes the School of Health Professions and the School of Medicine. The Sinclair School of Nursing has a central focus on scholarly nursing research. Many of the award-winning faculty are featured in nursing journals and professional publications. Applicants must be eligible for an RN license and have an associate's degree or nursing diploma from an accredited school. The program requires students complete a limited number of on-campus days. The University of Missouri is regionally accredited by The Higher Learning Commission (HLC). The nursing programs are accredited by the Commission on Collegiate Nursing Education. Michigan State University, College of Nursing ranks #18 on The 50 Best RN to BSN Online Programs! Michigan State University (MSU), a public, land-grant, sea-grant, research university founded in 1855, is among the largest universities in the nation with more than 50,000 students enrolled. The university offers more than 200 academic programs through 17 colleges. Created in 1950 as the Department of Nursing Education, the College of Nursing faculty has received funding from five different institutes of the NIH. The school has partnerships in areas such as China and Africa. The MSU College of Nursing faculty has 15 Fellows, including nine Fellows in the American Academy of Nursing, two Fellows in the American Association of Nurse Practitioners, one Fellow in the American College of Sports Medicine, one Fellow in the American Heart Association, one Fellow in the National League for Nursing Academy of Nursing Education, and one Fellow in the National Academies of Practice. The College of Nursing's research strengths include: nutrition, cancer, gerontology, obesity and associated conditions, chronic illness management, and physical activity. Michigan State University's College of Nursing offers a part-time online RN to BSN program. The online program helps students develop their critical-thinking skills. The program also prepares graduates for successful careers in nursing as well as further study. Students can complete the program in five semesters. Michigan State University offers admission on a rolling basis with three start dates each year. Students must complete 117 clinical hours in leadership and community health at sites convenient to them. Michigan State University is regionally accredited by The Higher Learning Commission (HLC). The College of Nursing's programs are also accredited by the Commission on Collegiate Nursing Education. University of South Carolina, College of Nursing ranks #19 on The 50 Best RN to BSN Online Programs! The University of South Carolina, a public, sea-grant, coeducational university founded in 1801, enrolls about 49,200 students. The flagship of the University of South Carolina system, the University of South Carolina offers more than 350 academic programs through more than a dozen schools and colleges. The University of South Carolina College of Nursing undergraduate program produces the most BSN graduates in the state. The College of Nursing facilitates exchange opportunities for students and groups from various countries. The College of Nursing focuses on three research areas: vulnerable populations, health systems, and cancer survivorship. The college operates two research centers, the Cancer Survivorship Center and the Healthcare Process and Redesign Center. The College of Nursing has partnerships with the College of Nursing Partnership Board, regional hospital and healthcare systems and more. The University of South Carolina's RN to BSN online program provides students with a comprehensive nursing foundation. Designed for registered nurses, the fully online program focuses on leadership, professionalism, and healthcare informatics. The program allows students to develop their critical-thinking, leadership, and professional skills. Students can complete the 31-unit program in 12 months. The University of South Carolina is regionally accredited by The Southern Association of Colleges and Schools Commission on Colleges (SACS). The school is also accredited by the Commission on Collegiate Nursing Education. Villanova University, College of Nursing ranks #20 on The 50 Best RN to BSN Online Programs! Villanova University, a private, research university, is among the oldest Catholic universities in the state, founded in 1842. Villanova enrolls about 10,400 students through five colleges, including business, engineering, and law. The Villanova University College of Nursing allows students to pursue degrees ranging from bachelor's to master's to Doctor of nursing practice and doctorates in nursing and boasts 7,000 alumni. The College of Nursing educates nurses within the framework of Christian beliefs and values as well as the heritage of the Order of St. Augustine. The College of Nursing prepares graduates to take roles in all settings providing healthcare. The Villanova University College of Nursing has three centers: Center for Nursing Research, Center for Global and Public Health, and the MacDonald Center for Obesity Prevention and Education. The College of Nursing received recognition from the National League for Nursing as a Center of Excellence in Nursing Education for Advancing the Science of Nursing Education. Offered through the College of Nursing, Villanova University's online RN to BSN degree program helps students develop strong analytical, critical-reasoning, and leadership skills. Designed for registered nurses, the degree program prepares nurses for leadership roles. Villanova University awards credits toward the degree through completion of a clinical decision-making assessment and an accredited nursing program. The RN to BSN online program features the same curriculum as the on-campus program. Online students have 24/7 access to course materials. Students must complete two clinical practica at their place of employment or a nearby health facility. Villanova University is regionally accredited by the Middle States Commission of Higher Education (MSCHE). Villanova's nursing programs are accredited by the Commission on Collegiate Nursing Education. Northeastern University, School of Nursing ranks #21 on The 50 Best RN to BSN Online Programs! Northeastern University, a private, research university founded in 1898, enrolls nearly 25,000 students. The university offers about 200 undergraduate, graduate and doctoral programs through more than a dozen schools and colleges. The School of Nursing offers a host of degree options, such as a bachelor's in nursing, a Doctor of nursing practice, and master's degrees in family nurse practitioner and nursing administration, among others. Northeastern University received recognition from the National League for Nursing for Enhancing Student Learning and Professional development. Northeastern University's School of Nursing offers an RN to BSN online program, designed for licensed registered nurses. The comprehensive curriculum features problem-based learning, simulated decision making, and advanced learning methodologies. The program prepares graduates for advancement and to use research, informatics, and evidence to enhance and inform nursing practice. Students must complete a clinical experience in community nursing/public health. Northeastern University is regionally accredited by the New England Association of Schools and Colleges, Commission on Institutions of Higher Education (NEASC-CIHE). The nursing programs are also accredited by The Commission on Collegiate Nursing Education. University of Texas at Arlington ranks #22 on The 50 Best RN to BSN Online Programs! The University of Texas at Arlington, a public research university founded in 1895, is among the largest universities in the state with 39,700 students enrolled. Part of the University of Texas System, the University of Texas at Arlington offers 185 programs leading to bachelor, master and doctoral degrees. The College of Nursing and Health Innovation is the largest producer of baccalaureate educated nurses in the state. The College of Nursing and Health Innovations enrolls about 17,000 students online and on-campus. The University of Texas at Arlington received recognition from the National League for Nursing for Enhancing Student Learning and Professional development. Faculty members have received recognition nationally and internationally in research areas including cardiovascular health, health care service, diverse populations, disease prevention, women's health, and geriatric health. The faculty includes members of the Fellows in the American Academy of Nursing. Offered through the College of Nursing and Health Innovation, the online RN to BSN degree prepares graduates for director and management positions as well as to offer a higher level of expertise and knowledge for patients. The flexible program features research-based learning, liberal arts, and leadership training. Open to nurses who hold a diploma or associate's degree, the curriculum helps students develop critical-thinking and decision-making skills. Students also complete a capstone course. The university does not offer the online program to residents of Alaska, Maryland, Oregon, Tennessee, and Washington. The University of Texas at Arlington is regionally accredited by The Southern Association of Colleges and Schools Commission on Colleges (SACS). The school is also accredited by the Commission on Collegiate Nursing Education. University of Massachusetts – Amherst, College of Nursing ranks #23 on The 50 Best RN to BSN Online Programs! The University of Massachusetts – Amherst, a public, land-grant university founded in 1863, offers more than 220 bachelor, master and doctoral degrees through nine colleges and schools. The flagship of the University of Massachusetts system, the university is among the largest in New England with more than 29,000 students enrolled. The College of Nursing allows students to pursue a variety of nursing degrees from bachelor to doctorate as well as certificates. Some of the College of Nursing's most prominent research areas include social justice in nursing, mental health care, gerontology and caring for the elderly, symptom self-management, and managing chronic illness. The University of Massachusetts – Amherst offers an online RN to BS in Nursing through the College of Nursing. The degree prepares nurses for leadership roles. The university offers spring or summer start dates. Students can complete the RN to BSN program in one year. The same faculty teach the online and on-campus courses. Students also must complete a capstone course. Applicants must hold a current RN license and 60 non-nursing credits. The University of Massachusetts - Amherst is regionally accredited by the New England Association of Schools and Colleges, Commission on Institutions of Higher Education (NEASC-CIHE) and by the Commission on Collegiate Nursing Education. Florida International University ranks #24 on The 50 Best RN to BSN Online Programs! Florida International University, a public research university founded in 1965, offers hundreds of programs of study leading to undergraduate, graduate, professional and doctoral degrees in nearly two dozen schools and colleges. Part of the State University System of Florida, the university is among the largest in the nation with 54,000 students enrolled. Founded in 1982, the university's Nicole Wertheim College of Nursing and Health Sciences is the second largest producer of nurses in Florida. The Nicole Wertheim College of Nursing and Health Sciences enrolls about 2,400 students. The college offers programs such as nurse anesthetist, occupational therapy, and communication sciences and disorders. The U.S. Department of Veterans Affairs selected the Nicole Wertheim College of Nursing and Health Sciences for the VA Nursing Academic Partnership Program. Designed for licensed registered nurses, the RN to BSN online program consists of courses in nursing leadership in global healthcare, community health, and wellness and care across cultures. The program, which builds on 60 credits from an associate's degree, features evidence-based nursing practices and prepares graduates for nursing careers or further study. Students also must complete 120 practicum hours. Florida International University is regionally accredited by the Southern Association of Colleges and Schools Commission on Colleges (SACS), and its nursing programs are accredited by the Commission on Collegiate Nursing Education. Florida Atlantic University, Christine E. Lynn College of Nursing ranks #25 on The 50 Best RN to BSN Online Programs! Florida Atlantic University, a public university founded in 1961, offers nearly 200 undergraduate and graduate programs and a professional degree in medicine through nearly a dozen colleges. A member of the State University System of Florida, the university enrolls more than 30,000 students from around the world. Established in 1979, the university's Christine E. Lynn College of Nursing enrolls about 1,400 students and provides degrees ranging from baccalaureate to doctoral. The Christine E. Lynn College of Nursing has more than 10 Fellows in the American Academy of Nursing, five Fellows in the American Academy of Nurse Practitioners and the National Academies of Practice, and two Robert Wood Johnson Executive Nursing Fellows. The Christine E. Lynn College of Nursing offers an online RN to BSN degree program, which prepares graduates to pursue certification in holistic nursing, graduate nursing degrees or careers as a clinical nurse, community health nurse, clinical leader, or emergency room nurse, among others. Designed for licensed RNs with a diploma or associate's degree in nursing, the program provides students with skills to transform healthcare systems through leadership with a curriculum based on national nursing standards and evidence-based practice. Students must complete a 180-hour practicum. Florida Atlantic University is regionally accredited by the Southern Association of Colleges and Schools Commission on Colleges (SACS) and the Commission on Collegiate Nursing Education. University of Alabama, Capstone College of Nursing ranks #26 on The 50 Best RN to BSN Online Programs! The flagship of the University of Alabama System, the University of Alabama (UA), founded in 1820, is the oldest public university in the state. UA, a public, sea-grant, space-grant, research university, enrolls 37,000 students and offers a host of bachelor, master, doctoral and education specialist programs in more than a dozen academic divisions. Founded in 1975, the Capstone College of Nursing enrolls about 2,300 students in several bachelor's and master's degrees as well as a doctorate for nurse educators and a Doctor of nursing practice. Offered through the Capstone College of Nursing, the online RN to BSN program prepares nurses for leadership roles or further education. Designed for registered nurses with an associate's degree or diploma in nursing, the program includes online nursing courses and clinical experiences. The college offers the program on a full-time or part-time basis. Students can complete the required nursing courses online and participate in clinical experiences close to home. The University of Alabama is regionally accredited by The Southern Association of Colleges and Schools Commission on Colleges (SACS). The nursing programs are accredited by the Commission on Collegiate Nursing Education. University of Massachusetts Boston ranks #27 on The 50 Best RN to BSN Online Programs! The University of Massachusetts Boston, a public, research university established in 1852, enrolls 16,700 students. A member of the University of Massachusetts system, UMass Boston offers a host of undergraduate, graduate and doctoral degrees and certificate programs through nearly a dozen colleges and schools. UMass Boston's College of Nursing and Health Sciences enables students to pursue more than a dozen nursing and health sciences programs, ranging from bachelor's to doctorates and certificates. The College of Nursing and Health Sciences has partnerships with more than 200 healthcare and fitness organizations. The college's faculty have received national recognition for research in health disparities, cancer, health policy, oncology care, obesity prevention, and exercise science. Offered through the College of Nursing and Health Sciences, in conjunction with the College of Advancing and Professional Studies, the online RN-BS program features online course materials and hands-on experiences. The program provides students with a solid nursing foundation. The RN-BS online degree program can be completed in as few as three semesters. The program is 100% online, with optional synchronized classes, allowing students to meet virtually with faculty and fellow classmates. Students in the area also have the option of taking face-to-face courses at Cape Cod Community College. Rather than requiring a clinical, the online program allows students to complete a service learning project in the student's own community. The University of Massachusetts Boston is regionally accredited by the New England Association of Schools and Colleges, Commission on Institutions of Higher Education (NEASC-CIHE). The baccalaureate degree program in nursing/master’s degree program in nursing/Doctor of Nursing Practice program and/post-graduate APRN certificate program at the University of Massachusetts Boston is accredited by the Commission on Collegiate Nursing Education, 655 K Street NW, Suite 750, Washington, DC 20001, 202-887-6791. SUNY University at Buffalo, School of Nursing ranks #28 on The 50 Best RN to BSN Online Programs! The State University of New York at Buffalo, a public, flagship, sea-grant, space-grant, research university founded in 1846, is the largest in the SUNY system with 29,800 students enrolled. SUNY University of New York at Buffalo offers about 400 degree programs, ranging from bachelor to doctoral and professional degrees. Founded in 1936, the School of Nursing offers undergraduate, graduate and doctoral degrees in patient care and nursing practice. The School of Nursing's online RN to BSN program builds upon registered nurses' experience and knowledge. The degree program provides students with the leadership skills to advance patient safety, quality of care, and health services. The nursing program follows an asynchronous format. Students choose from a one-year or two-year sequence. Applicants must hold an associate's degree or nursing diploma and have passed the NCLEX-RN exam. The University at Buffalo is regionally accredited by the Middle States Commission of Higher Education (MSCHE). Its School of Nursing is also accredited by the Commission on Collegiate Nursing Education. Duquesne University, School of Nursing ranks #29 on The 50 Best RN to BSN Online Programs! Duquesne University, a private Catholic university founded in 1878, enrolls 10,300 students. The university offers around 190 academic programs leading to a host of undergraduate, graduate, professional and doctoral degrees through 10 schools and colleges. Established in 1935, the Duquesne University School of Nursing enrolls about 1,000 students in bachelor, master, and doctoral degree programs as well as a post-master's certificate program. The School of Nursing is a National League for Nursing Center of Excellence in Enhancing Student Learning and Professional Development. Designed for registered nurses who hold an associate's degree or diploma in nursing, Duquesne University's RN-BSN online degree program integrates clinical judgment skills and evidence-based practice. Offered through the School of Nursing, the program also helps students develop strong analytical, clinical-reasoning, ethical decision-making, communication and leadership skills. Students must complete 90 hours of community clinical experience; students work with a faculty mentor to find an appropriate site. The university allows students to enroll in master's-level courses while enrolled as RN-BSN student. Duquesne University does not offer its online programs to residents of Alabama, Arkansas, Iowa, Kentucky, Louisiana, Massachusetts, Minnesota, New Mexico, New York, North Carolina, Oregon, Tennessee, Washington, or Wisconsin. Duquesne Univeristy is regionally accredited by Middle States Commission of Higher Education (MSCHE). The school is also accredited by the Commission on Collegiate Nursing Education. East Carolina University, College of Nursing ranks #30 on The 50 Best RN to BSN Online Programs! East Carolina University, a public, sea-grant, doctoral/research university founded in 1907, is among the largest universities in the state with about 28,500 students enrolled. Through more than a dozen colleges and schools, East Carolina University offers approximately 200 degree programs from bachelor's to doctorates. Established in 1959, with 135 faculty members, 35 staff members, and nearly 1,200 students enrolled across all degree programs, the College of Nursing is the top producer of new nurses among North Carolina's four-year educational institutions. East Carolina University has received a designation as a National League for Nursing Center of Excellence three times. The East Carolina University College of Nursing offers a number of nursing degrees including those in nurse midwifery, nursing leadership, and adult gerontology. The College of Nursing's online RN to BSN program emphasizes the learning of principles and concepts, and the use of the nursing process in caring for people, families and groups. All the courses are conducted online. The degree program, which builds on a solid foundation in natural and behavioral sciences, and liberal arts education, prepares graduates for leadership roles. The program also allows students to hone their critical-reasoning, ethical decision-making, and communication skills. The curriculum, which meets the requirements of the accrediting body, the Commission on Collegiate Nursing Education, is based on prospective student feedback so it's flexible to fit with a busy working nurse's personal and professional lives. The College of Nursing reports all students, including online learners, become part of their community and receive added support to ensure their success. RN/BSN students receive an introductory orientation and access to resources such as academic counseling, faculty mentoring and support from the IT department. Applicants must hold an associate's degree or nursing diploma and a valid registered nurse license. Placement exams are not required. ECU does not offer online programs to residents of Alabama, Massachusetts, Minnesota, Maryland, or Ohio. East Carolina University is regionally accredited by The Southern Association of Colleges and Schools Commission on Colleges (SACS). The nursing programs are also accredited by The Commission on Collegiate Nursing Education. University of North Carolina at Charlotte, School of Nursing ranks #31 on The 50 Best RN to BSN Online Programs! The University of North Carolina at Charlotte, a public research university founded in 1946, offers more than 170 bachelor, master and doctoral programs through nine colleges. The university enrolls 28,700 students. The College of Health and Human Services features academic units such as the Department of Public Health Sciences, the School of Social Work, the Department of Kinesiology, and the School of Nursing. Established in 1965, the School of Nursing enrolls about 550 students in undergraduate and graduate programs. The University of North Carolina at Charlotte received recognition from the National League for Nursing as a Center of Excellence in Nursing Education for Enhancing Student Learning and Professional Development. Offered through the College of Health and Human Services' School of Nursing, the online RN to BSN completion program helps advance and enhance students' professional nursing careers. Designed for registered nurses who hold an associate's degree or diploma in nursing, the program features instruction and hands-on experience. Some courses require clinical experiences. The university offers summer, fall and spring admission. Students can complete the RN to BSN program in one year. The University of North Carolina at Charlotte is regionally accredited by The Southern Association of Colleges and Schools Commission on Colleges (SACS). The School of Nursing is also accredited by the Commission on Collegiate Nursing Education. Kent State University, College of Nursing ranks #32 on The 50 Best RN to BSN Online Programs! Kent State University, a public research university founded in 1910, is among the largest in the state with 40,700 students enrolled. At Kent State University, students can pursue more than 300 degree programs ranging from associate's to doctorates. Established in 1967, the College of Nursing, one of the largest nursing programs in the nation, offers a host of nursing programs. The College of Nursing has partnerships with more than 350 hospitals, clinics, schools, community groups, and healthcare organizations. Kent State University received recognition from the National League for Nursing as a Center of Excellence in Nursing Education for Advancing the Science of Nursing Education. Developed for RNs with an associate's degree or nursing diploma, Kent State University's RN to BSN online program prepares students to meet the challenges of professional nursing and influence the future of health care. The College of Nursing's RN to BSN program consists of classroom instruction and clinical experiences. Students can transfer up to 33 nursing credits from their diploma program or associate's degree. Kent State offers rolling admissions. The nursing courses follow a seven-week format. The college does not require on-campus visits. Students can complete the program in as little as 12 months. Kent State University is regionally accredited by The Higher Learning Commission (HLC). The College of Nursing is also accredited by the Commission on Collegiate Nursing Education. Saint Louis University, School of Nursing ranks #33 on The 50 Best RN to BSN Online Programs! Saint Louis University (SLU), a private, Catholic university founded in 1818, is among the oldest Jesuit universities in the nation. A member of the Association of Jesuit Colleges and Universities, SLU enrolls 13,500 students from around the world and offers a host of academic programs. SLU's School of Professional Studies, established in 1963, focuses on programs for adult learners. The Saint Louis University School of Nursing offers baccalaureate, master, post-master and doctoral-level nursing programs. The School of Nursing faculty members have received numerous prestigious awards, honors, and fellowships. Through the School of Professional Studies and the School of Nursing, Saint Louis University students can complete an online RN to BSN program. The program, which follows an accelerated format, blends nursing theory with practice. The fully online program consists of 120 total credit hours, including 30 hours students must complete at SLU. Saint Louis University offers five start dates each year. Saint Louis University is regionally accredited by The Higher Learning Commission (HLC) and the Commission on Collegiate Nursing Education. University of Central Florida, College of Nursing ranks #34 on The 50 Best RN to BSN Online Programs! The University of Central Florida (UCF), a public, space-grant research university founded in 1963, is among the largest universities in the nation with 63,000 students enrolled. Students can pursue degrees in more than 200 program areas through more than a dozen schools. UCF boasts more than 250,000 alumni. The UCF College of Nursing, educating nurses since 1979, offers a range of nursing degrees ranging from baccalaureate to doctorate. The UCF College of Nursing faculty includes six endowed chairs, more than 10 fellows of national organizations, two certified health care simulation educators, and two advanced health care simulation educators. Designed for licensed RNs who hold an associate's degree in nursing, the RN to BSN online program prepares graduates for leadership roles. The online program builds upon a strong academic foundation and also allows students to complete graduate-level coursework toward the MSN. Students can complete all coursework online in about five semesters. Online students can complete practicum requirements near their residence. The University of Central Florida is regionally accredited by Southern Association of Colleges and Schools Commission on Colleges (SACS). The nursing program is also accredited by the Commission on Collegiate Nursing Education. University of Louisville, School of Nursing ranks #35 on The 50 Best RN to BSN Online Programs! The University of Louisville, a public university established in 1798, enrolls 22,300 students from around the world. The university's degree offerings include 170 programs leading to bachelor, master and doctoral degrees. Through the University of Louisville School of Nursing, the university enables students to earn a range of degrees from bachelor to doctorate. The University of Louisville offers an online RN to Bachelor of Science in Nursing program through its School of Nursing. Designed for RNs who hold a diploma or associate's degree in nursing, the program enables students to gain advanced knowledge and provide leadership in the evolving healthcare system. Students must complete a practicum project near their residence. Online students at the University of Louisville have access to virtual writing center, tutoring services, library services, and technical support. The University of Louisville is regionally accredited by The Southern Association of Colleges and Schools Commission on Colleges (SACS) and the Commission on Collegiate Nursing Education. West Virginia University, School of Nursing ranks #36 on The 50 Best RN to BSN Online Programs! West Virginia University (WVU), a public, flagship, space-grant, land-grant university established in 1867, enrolls about 29,000 students. Through 15 colleges, the university offers nearly 200 bachelor, master, professional and doctoral degree programs. WVU's School of Nursing enables students to pursue baccalaureate to doctoral degrees in nursing. The School of Nursing has a research focus on reducing health disparities among rural Appalachians. West Virginia University offers an RN to BSN online program through its School of Nursing. Developed for licensed registered nurses who also completed an associate's degree or diploma program in nursing, the program builds on general education coursework. WVU offers summer, fall and spring admission to its online RN to BSN program. West Virginia University is regionally accredited by The Higher Learning Commission (HLC). The School of Nursing programs are accredited by the Commission on Collegiate Nursing Education. University of Missouri-St. Louis, College of Nursing ranks #37 on The 50 Best RN to BSN Online Programs! The University of Missouri-St. Louis, a public, land-grant, research university established in 1963, enrolls about 16,800 students. Part of the University of Missouri System, the university offers bachelor, master and doctoral degrees through several colleges, such as the College of Business Administration, the College of Nursing, and the College of Education. Founded in 1981, the College of Nursing enrolls more than 1,100 students in nursing programs ranging from bachelor to doctorates. The College of Nursing offers an RN to Bachelor of Science in Nursing online program designed for students who hold an RN license and a diploma or associate's degree in nursing. The program builds upon a strong liberal arts foundation and prepares graduates to care for the complex needs of people and populations. The curriculum explores concepts such as nursing research, leadership, health assessment, and evidence-based practice. Students also must complete clinical hours. UMSL's College of Nursing does not require on-campus visits, but encourages students to attend an orientation. The courses follow an asynchronous format with set deadlines. The University of Missouri – St. Louis is regionally accredited by The Higher Learning Commission. The university's College of Nursing also is also accredited by the Commission on Collegiate Nursing Education. University of Southern Indiana ranks #38 on The 50 Best RN to BSN Online Programs! The University of Southern Indiana (USI), a public university founded in 1965, enrolls nearly 11,000 students. USI students can choose from more than 80 majors leading to a host of undergraduate, graduate and doctoral degrees through a number of colleges. The USI College of Nursing and Health Professions enrolls thousands of students in more than a dozen educational programs, such as diagnostic medical sonography, dental assisting, and occupational therapy, among others. The College of Nursing and Health Professions has award-winning nursing faculty members. USI offers an online RN to BSN program through its College of Nursing and Health Professions. Designed for registered nurses with an associate's degree or diploma in nursing, the curriculum builds on a foundation of physical, biological, and social sciences. Students can complete the program on a full-time or part-time basis with clinical experiences near their home. The University of Southern Indiana is regionally accredited by The Higher Learning Commission (HLC). The university's College of Nursing and Health Professions is also accredited by the Commission on Collegiate Nursing Education. University of Tennessee Chattanooga, School of Nursing ranks #39 on The 50 Best RN to BSN Online Programs! The University of Tennessee at Chattanooga, a public university founded in 1886, enrolls about 12,700 students. Part of the University of Tennessee System, Chattanooga offers more than 240 undergraduate, graduate and doctoral programs, including those in physical therapy and computational engineering. Established in 1969, the School of Nursing prepares students to work in the interprofessional environment with a range of degree programs. The University of Tennessee at Chattanooga's Online RN-BSN Gateway program helps students develop skills and knowledge necessary for career advancement or graduate study in nursing. Offered through the School of Nursing, the program emphasizes decision-making and critical-thinking skills. The university offers the program to practicing RNs with a current RN license and an associate's or diploma in nursing. The University of Tennessee at Chattanooga is regionally accredited by The Southern Association of Colleges and Schools Commission on Colleges (SACS) and its programs. The school is also accredited by the Commission on Collegiate Nursing Education. University of Massachusetts Dartmouth, College of Nursing ranks #40 on The 50 Best RN to BSN Online Programs! The University of Massachusetts Dartmouth, a public university founded in 1895, enrolls about 8,600 students. Part of the University of Massachusetts system, UMass Dartmouth offers more than 170 degree programs ranging from undergraduate and doctoral degrees as well as certificate programs. Established in 1969, the College of Nursing enrolls more than 600 students in undergraduate and graduate nursing and doctoral programs. UMass Dartmouth's College of Nursing's online Nursing RN-BS program builds on students' nursing experience while providing an in-depth study of social and physical sciences, management and leadership, public health, community, the humanities, and research. The curriculum emphasizes communication skills, therapeutic interventions, and professional development. The Nursing RN-BS program prepares graduates for careers in specialized care, education, and management. Students gain real-world experience during clinical community nursing courses. Online students have access to tutoring and academic advising. UMass Dartmouth does not offer the online program to students in Alabama, Arkansas, Iowa, Kansas, Kentucky, Louisiana, Maryland, Nevada, New Mexico, Minnesota, North Carolina, Texas, Washington, or West Virginia. UMass Dartmouth is regionally accredited by the New England Association of Schools and Colleges, Commission on Institutions of Higher Education (NEASC-CIHE). The nursing programs are accredited by the Commission on Collegiate Nursing Education. Ball State University, School of Nursing ranks #41 on The 50 Best RN to BSN Online Programs! Ball State University, a public, coeducational university founded in 1918, enrolls 22,000 students. Through eight colleges, such as the College of Architecture and Planning, the Miller College of Business, and the College of Fine Arts, Ball State University offers a variety of academic programs leading to a range of bachelor, master, specialist, and doctoral degrees. Ball State University's School of Nursing offers nursing undergraduate and graduate programs. Ball State University received recognition from the National League for Nursing as a Center of Excellence in Nursing Education for Enhancing Student Learning and Professional Development. Ball State University's online RN to BS integrates psychosocial, physical, and nursing science with humanities and fine arts, while emphasizing care in community settings for children and women. The curriculum also enables students to hone their decision-making skills. Ball State University allows students to complete the online RN to BS with a flexible, asynchronous format. The university also offers rolling admissions, and students can enroll on a full-time or part-time basis. Ball State University requires no on-campus visits, and online students have access to academic advising and tech support. Applicants must hold a current RN license and a nursing diploma or degree. Nursing students must complete 180 clinical hours with a nursing mentor-preceptor close to their home. Ball State University is regionally accredited by The Higher Learning Commission (HLC) and the Commission on Collegiate Nursing Education. La Salle University, School of Nursing and Health Sciences ranks #42 on The 50 Best RN to BSN Online Programs! La Salle University, a private, coeducational, Catholic university established in 1863, enrolls approximately 6,000 students. La Salle offers bachelor, master and doctoral degrees in a number of academic areas. La Salle University's School of Nursing and Health Sciences offers undergraduate and graduate degrees in nursing, nutrition, public health, and communication sciences and disorders. Designed for RNs who earned an associate's degree or diploma in nursing, La Salle's School of Nursing and Health Sciences' Accelerated RN-BSN program prepares graduates to effect change in community systems and healthcare as well as for graduate study. The curriculum helps students implement strategies for risk reduction, disease prevention, and health promotion for people, families, groups, and communities. The program also enables students to hone their critical-thinking skills and enhance their professional and personal growth. The program follows a cohort-based format with start dates in June and January. La Salle University is regionally accredited by the Middle States Commission of Higher Education (MSCHE). The nursing programs are accredited by the Commission on Collegiate Nursing Education. Drexel University, College of Nursing and Health Professions ranks #43 on The 50 Best RN to BSN Online Programs! Drexel University, a private, non-profit, coeducational research university founded in 1891, enrolls 26,000 students in more than 170 undergraduate, graduate, doctoral and professional programs. The College of Nursing and Health Professions enrolls more than 5,000 students and offers more than two dozen undergraduate and graduate health professions and nursing programs, including some which integrate periods of full employment into the curriculum. Drexel University's College of Nursing and Health Professions' RN to BSN online degree program features action-based learning and in-depth clinical skills. The curriculum helps students hone their critical-thinking, communication, decision-making, and leadership skills. The program also teaches students to improve patient outcomes. Students can work with virtual patients through the Health Assessment Simulation Lab. Applicants must hold an associate's degree or diploma in nursing and a current RN license. Online students have access to tech support, a writing center, and library resources. Drexel University is regionally accredited by The Middle States Commission of Higher Education (MSCHE). The nursing programs are accredited by the Commission on Collegiate Nursing Education. University of Rhode Island, College of Nursing ranks #44 on The 50 Best RN to BSN Online Programs! The University of Rhode Island, a public, flagship, land-grant, sea-grant university founded in 1892, offers more than 120 undergraduate, graduate, and doctoral degrees through eight colleges. The university enrolls about 16,600 students. The College of Nursing has about 850 students. The College of Nursing allows students to pursue bachelor and master degrees in nursing as well as a doctorate and a Doctor of nursing practice. The University of Rhode Island's College of Nursing online RN to BS in Nursing degree program integrates scientific inquiry, clinical practice, and creative thinking. The curriculum features research-based, science-focused academic experience. The program also helps students develop strong communication skills. The online program features the same professors as on-campus courses. The online RN to BS in Nursing program consists of seven-week courses. Students can complete the 24-credit-hour nursing program in as few as 15 months. Students also complete a community/public health nursing practicum. Applicants must hold an RN license and an associate's degree or diploma in nursing. The University of Rhode Island is regionally accredited by New England Association of Schools and Colleges, Commission on Institutions of Higher Education (NEASC-CIHE). The nursing programs are accredited by the Commission on Collegiate Nursing Education. 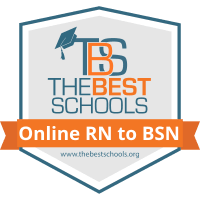 Georgia Southern University, College of Health and Human Sciences ranks #45 on The 50 Best RN to BSN Online Programs! Georgia Southern University (GSU), a public, land-grant university founded in 1906, enrolls 20,600 students from around the world. Part of the University System of Georgia, the university offers more than 100 academic majors leading to a host of baccalaureate, master and doctoral degrees. The GSU College of Health and Human Sciences allows students to pursue a host of degrees in nursing, health and kinesiology, and human ecology. The College of Health and Human Services includes the School of Nursing. Designed for registered nurses, the online RN-BSN program focuses on evidence-based decision making. The program teaches students to incorporate compassion, caring, and empathy in all aspects of nursing practice. Students can complete the program on a full-time or part-time basis in three or four semesters. The online RN-BSN program features courses with synchronous and asynchronous elements. Students must attend an orientation session. Applicants must hold a valid RN license in Georgia. Georgia Southern University is regionally accredited by The Southern Association of Colleges and Schools Commission on Colleges (SACS). The school is also accredited by the Commission on Collegiate Nursing Education for its nursing programs. Illinois State University, Mennonite College of Nursing ranks #46 on The 50 Best RN to BSN Online Programs! Illinois State University is among the oldest public universities in the state, founded in 1857. ISU enrolls 20,700 students in a host of bachelor, master, and doctoral degree programs through six colleges. Established in 1919, the Mennonite College of Nursing offers bachelor, master and doctoral programs in nursing both on-campus and online. Mennonite College of Nursing faculty members have received awards for their teaching expertise. Illinois State University if regionally accredited by The Higher Learning Commission (HLC). The school is also accredited by the Commission on Collegiate Nursing Education. Northern Arizona University, School of Nursing ranks #47 on The 50 Best RN to BSN Online Programs! Northern Arizona University, a public university founded in 1899, enrolls 30,300 students in a host of undergraduate and graduate degree programs. The School of Nursing offers several bachelor degree options as well as two master's degrees and a Doctor of nursing practice. Offered through the School of Nursing, Northern Arizona University's RN-to-BSN online degree program builds on an associate's degree in nursing and a liberal arts foundation. Designed for registered nurses, the program prepares graduates for careers in hospital nursing, family nursing, critical care nursing, and rehabilitation, among others. The RN-to-BSN curriculum also enables students to hone their communication, critical-reasoning and critical-thinking skills. Students complete a practicum and a capstone course in nursing leadership. Northern Arizona University is regionally accredited by The Higher Learning Commission (HLC). The university is also accredited by the Commission on Collegiate Nursing Education. Regis University, Rueckert-Hartman College of Health Professions ranks #48 on The 50 Best RN to BSN Online Programs! Regis University, a private, coeducational, Catholic university founded in 1877, enrolls 8,700 students in a number of degree programs through five colleges. The university's Rueckert-Hartman College for Health Professions prepares students for careers in a variety of health professions with three schools – Pharmacy, Physical Therapy, and Nursing. The Loretto Heights School of Nursing awards bachelor's degrees in traditional, accelerated and degree completion formats, as well as several master's degrees in nursing and Doctor of nursing practice programs. Offered through the Rueckert-Hartman College of Health Professions and the Loretto Heights School of Nursing, the online RN to Bachelor of Science in Nursing Completion program prepares graduates for leadership positions and promotions. Designed for registered nurses who also hold an associate's degree in nursing, the curriculum focuses on community health, ethics, and evidence-based practice. The RN to BSN completion program features a flexible, asynchronous format with no campus visits required. Regis University offers three start dates each year. With eight-week courses, students can complete the program in 18 to 24 months. Students must complete a community health nursing practicum and a leadership capstone course. Regis University is regionally accredited by The Higher Learning Commission (HLC). The school is also accredited by the Commission on Collegiate Nursing Education. Western Kentucky University, School of Nursing ranks #49 on The 50 Best RN to BSN Online Programs! Western Kentucky University (WKU), a public university founded in 1906, enrolls about 21,000 students. Through six colleges, WKU offers more than 100 undergraduate and graduate degrees. Established in 1962, WKU's School of Nursing allows students to pursue a range of nursing programs from associate's to a Doctor of nursing practice. Designed for registered nurses who also hold an associate's degree in nursing, WKU's online RN to BSN Nursing Program allows students to expand their knowledge of health promotion and wellness. The curriculum focuses on evidence-based interventions and ethics. The RN to BSN program also enables students to hone their leadership and critical-thinking skills. The program requires some on-campus meetings. Students also must complete clinical practice hours near their residence. Western Kentucky University is regionally accredited by The Southern Association of Colleges and Schools Commission on Colleges (SACS). The school is also accredited by the Commission on Collegiate Nursing Education. University of Texas at Tyler School of Nursing ranks #50 on The 50 Best RN to BSN Online Programs! The University of Texas at Tyler, a public, coeducational university founded in 1971, enrolls about 10,000 students. Part of the University of Texas System, UT Tyler offers more than 90 academic programs leading to a number of bachelor, master, and doctoral degrees through six colleges. Housed in the College of Nursing & Health Sciences, the School of Nursing allows students to complete undergraduate degrees with several track options as well as graduate nursing degrees. UT Tyler offers an online RN-BSN Track through its College of Nursing and Health Sciences and School of Nursing. Designed for registered nurses who also hold an associate's degree or diploma in nursing, the curriculum focuses on leadership, professional development, and community nursing. Students complete clinical experiences in leadership and community. The University of Texas at Tyler is regionally accredited by The Southern Association of Colleges and Schools Commission on Colleges (SACS) and the Commission on Collegiate Nursing Education. The RN to BSN degree, also known as a Registered Nurse to Bachelor of Science in Nursing degree, is designed for registered nurses who also hold an associate's degree or diploma in nursing and seek a bachelor's degree in nursing. Online RN to BSN programs generally require 120 total credit hours, including a liberal arts and sciences foundation with courses in social and physical sciences. However, most RN to BSN programs are degree completion programs and allow undergraduate hours completed toward the associate's degree in nursing to count toward the BSN. Often, students need to complete 30 upper-level courses (90 credit hours) as well as practical or clinical hours to earn their Bachelor in Nursing degree. The Bachelor of Science in Nursing degree coursework prepares nurses for a broader scope of practice and a better understanding of the political, cultural, social, and economic issues affecting patients and influencing health care delivery. Nurses who advance their education through a Bachelor of Science in Nursing degree program develop more efficient communication, critical-thinking, organizational, and ethical decision-making skills, all necessary for successful nursing careers. Online RN-to-BSN degree programs typically include courses in leadership, pharmacology, pathophysiology, public health and community nursing, information management, nursing informatics, nursing research, health policy, and ethics. Through clinical training in non-institutional settings, BSN programs prepare nurses for practice in a host of health care settings. The RN-to-BSN program helps nurses develop the skills needed to further their careers as nurse practitioners, nurse anesthetists, nurse midwives, or post-secondary teachers. Depending on the specific program and a student's transfer credits, nurses can complete RN to BSN online programs in less than two years. In all states, registered nurses must hold a nursing license, which requires nurses to graduate from an approved nursing program and pass the National Council Licensure Exam (NCLEX-RN). The Bureau of Labor Statistics forecasts a 16 percent employment growth for registered nurses from 2014 to 2024, more than twice that of all occupations. U.S. News & World Report agrees, citing strong earning potential and low unemployment rates. The Bureau of Labor Statistics attributes job growth in part to a demand for healthcare services due to the aging population and to higher patient admittance at long-term care facilities and outpatient care centers. For more information, see our article "The Best Nursing Career Specialties."